Now that Sql Dev 1.1 is out, we can start showing some of the new way to extend it. The new thing I'll talk about is the new navigator. It's been re-written from scratch. This new one is mostly based all in XML much like lots of areas in Sql Dev. The schema will be published later but here's a quick peek at what can be done. This example will add a node to the connection under Oracle connections only name "Custom Table." I've updated the skeleton extension mentioned before to include this example. There's 1 changed file and 1 new file. connType="Oracle" - If you connected to one of the other databases supported this element of the tree would not show. 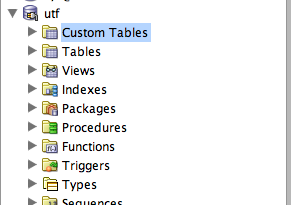 id="TABLE" - This will key all the editors for table to be used when clicked on. Also things like Edit/Create dialogs and context menus weight="0.0" - This is the sorting order. To make my new node show first , I made it 0.0. <icon RSKEY="/oracle/dbtools/raptor/images/table_folder.png"/> - This is where to get the icon to show for the folder in the tree. <label RSKEY="Custom Tables"/> - This is the name which will show in the tree. Second the file to be edited is the extension.xml. The change should be pretty easy to pick out from the diff. 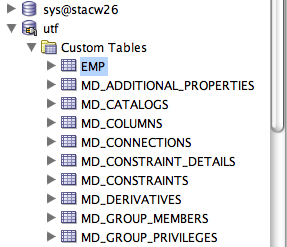 What this is doing is registering the new table.xml file so that Sql Dev will load it. In this case it's inside the package sample.